Groupe SEB has been successful in its challenge of claims about Imperial International’s Neverstick and Neverstick2, with the ASA ruling that the online ads do not substantiate claims the pans are more effective than competitor models, and must not appear again in their current form. 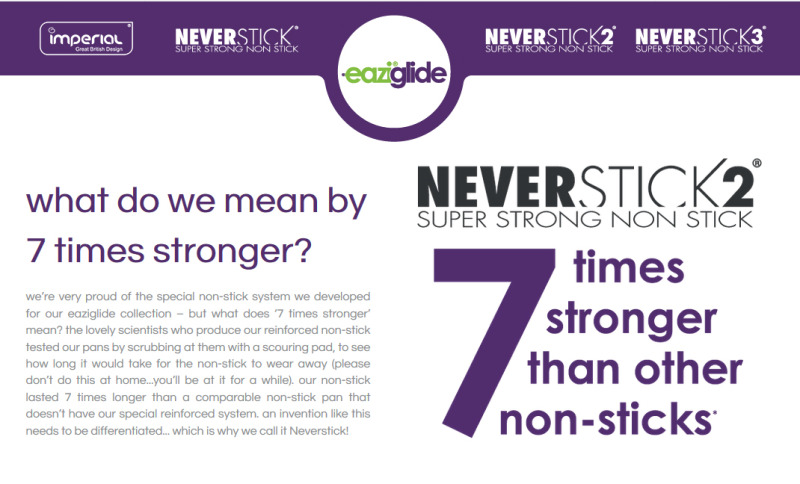 French small appliance firm Groupe SEB challenged claims on two websites - www.eazyglide.com and www.scoville.me – that Imperial International’s Neverstick 2 pan “is seven times stronger than other non-stick frying pans”, and that its Neverstick pan is “five times stronger than other non-sticks”; asking whether the claims were verifiable. Groupe SEB raised its concerns with The Advertising Standards Authority (ASA), which ruled that the claims could not be substantiated. The decision was made, despite Imperial providing evidence of independent laboratory abrasion testing against competitor products, that demonstrated its Neverstick coating lasted over 25,000 cycles and its Neverstick2 coating lasted over 75,000 cycles , compared with the strongest-performing rival product, which only lasted 4,897 cycles. Commenting on the ruling, the ASA said: “An ad which featured a comparison with an identifiable competitor or competitors needed to include, or direct a consumer to, sufficient information to allow them to understand the comparison, and be able to check the claims were accurate, or ask someone suitably qualified to do so. We considered that consumers would understand the claims to be a direct comparison between the pans’ non-stick capability and that of their competitors and that the claims therefore needed to be verifiable.